Blurb: Monolithic structures of morbid sound design and thunderous percussion yield some satisfying moments marred by excessive length. Blending grimly ambient textures with powerful, noisy beats and infused with bleak techno, Stockholm artist Alex Kassberg – a.k.a. 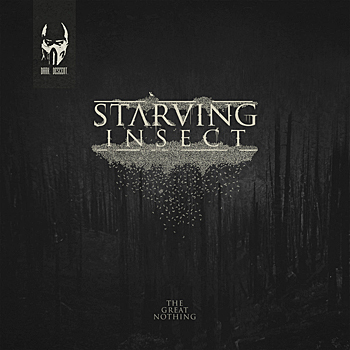 Starving Insect – treads many fine lines between varying styles of dark electronic music to achieve a singularly doom-laden effect; an effect that pervades through the appropriately titled The Great Nothing. Within the towering monolith that is the opening track, “Overhead, Without Any Fuss, the Stars Were Going Out,” Starving Insect presents this veritably apocalyptic hodgepodge true to its title, evocative of a cosmic cataclysm that not only sets the tone for the album as a whole, but the artist’s entire outlook. 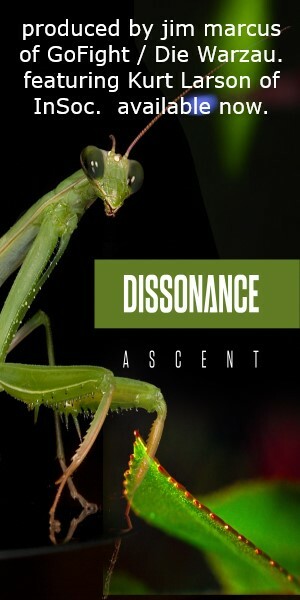 It begins simply enough – manipulated samples heard in the sonic distance amid clouds of hollow soundscapes that eventually give rise to a rhythmic marching of distorted beats and scathing electronic sequences, given an added sense of spiritual menace as the tolls of a church bell wax and wane in the mix. As the second track, “Breeding the Threnodies” begins, the steady but forceful percussion instilling an overdriven sense of tension, metallic shrieks amid moody passages the likes of which are not uncommon in harsher modes of EBM indicating an approaching menace that threatens the listener with each passing second. From here, The Great Nothing continues at a languid pace with each track adding certain elements, from the steely cold piano in “There Are No Doors” to the more skittering retro drum sounds of “IDDQD,” that has the unfortunate tendency to grow somewhat tiresome; that is, until the tempo picks up with the seething, almost club-friendly “Visions of the Blind Dead” with its dissonant loops evoking an epic, almost Wagnerian quality. The clever placement of samples makes up for the lack of vocals, but even so, each track tends to outstay its welcome with runtimes that exceed, six, seven, eight, even nine minutes through most of the album. This is especially true of tracks like “Sleep Is Death” as samples that ask “When was the last time you had trouble sleeping” complement the rising suspense of a shrill synth lead and morbid bass line, and though the hollowly fluidic atmospheres of “Dormant Storm” eventually pick up in speed with an almost elegiac organ tone and thunderous percussion, the track seems to linger in its own gloomy mire for longer than is necessary to achieve its desired effect. Finally bringing The Great Nothing to its conclusion is “Allt Dör,” over nine minutes of almost insect-like chirps floating in cavernous reverb, creating a repetitive pattern of tense percussive accompaniment to a steady thumping beat and a lush, almost choral ambience that is quite lovely on its own, but once again suffers from monotony, saved only by an unexpectedly sudden end. Starving Insect certainly makes a valiant attempt with The Great Nothing to penetrate the listener’s psyche and achieve a lasting impression of emptiness and lost hope; unfortunately, the excessive length required for most of the tracks to reach their thematic climax makes the album a somewhat more torturous affair… and not in a manner appropriate to the musical style on display. It’s a shame because the sound design exhibited by Kassberg is quite exceptional, more suggestive of rather than relying on the generic motifs employed by most in a similar vein. For this, The Great Nothing is worth a listen, but one should expect to skip around quite a bit.